Where does cosplay come from? 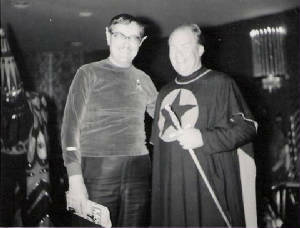 The hobby originated way back in 1939, when Forrest James Ackerman and his friend Myrtle A. Jones appeared in costume at the First World Science Fiction Convention in New York. 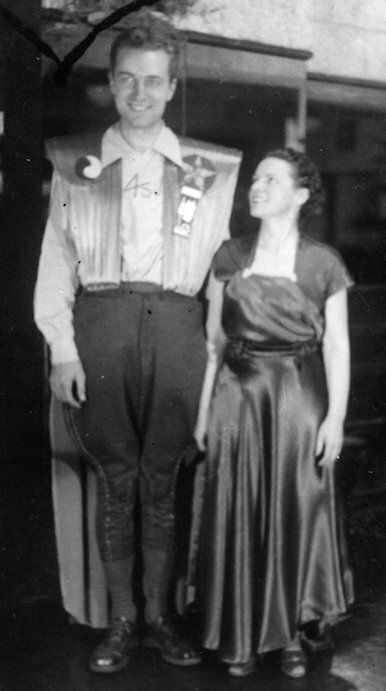 Forrest was dressed in a "futuristicostume" inspired by the 1933 film "Things to come", while Myrtle wore a gown recreated from the same film. Myrtle, known among sci-fi fans as "Morojo", was the one who had made the costumes. They stuck out like a sore thumb amidst the overly serious gathering of writers, resulting in one Frederik Pohl mentioning them in his book "The way the future was". He described them as "stylishly dressed in the fashions of the 25th century" but also wrote that he feared they had set an ominous precedent. He was right, as the next year there were 12 costumed attendees (as opposed to Forrest and Myrtle being 2 out of 185 visitors the year before) and the number only grew from there. Forrest Ackerman became notable with his "Famous monsters of Filmland" and continued attending Wondercon almost every year, always in costume. Below is another picture of him at WonderCon. Arthur Louis Joquel II is the guy on the right. From there, the number only expanded, with more and more people on conventions dressing up as their favourite sci-fi or fantasy character, whether it was a replica or a completely made up creation. But it wasn't until the 80s that the hobby was noticed by Nobuyuki (nov) Takahashi, the current Representative Director from Studio Hard. He went to Los Angeles SF Worldcon and reported about it in Japanese magazines back home. He was the one who took the Japanese tradition of taking the first syllables of different words to create a new term and apply it to this hobby. Thus, he created the term "cos-play", derived from "costume play", thereby gathering both the aspects of creating the costume and being the actual character. The Japanese word he used was "kosupure" and was supposedly used for the first time in the "My Anime" magazine from June 1983, of which the picture below is said to be a scan. What is obvious from the scan even without the knowledge of Japanese writing; the idea of dressing up in a "hero costume" appealed so much to the Japanese audience that they started applying it to their own media en masse. Even back then, it seems they already had everything ranging from the skimpier costumes, over mechas, to the ones with wings so massive one can hardly negotiate a convention floor safely. With their large industry of anything manga and anime related, fans started churning out cosplays by the numbers. As more and more of these Japanese media found their way to the western worlds, so did the fan-made costumes. Therefore, cosplay as a hobby was re-introduced in Europe and America. Which is why most of the cosplayers today mistakingly believe their hobby originated in Japan. Currently, cosplay has become such a widespread hobby that it is being practiced by people of all ages and kinds; including "crossplay" which is basically cosplaying a character of a different gender than you are. Championships are being held on local, national, European and even global basis. Nowadays, you can't go to a convention without having a large number of dressed up fans there. Like the members from Cosplay4Charity, some have taken their cosplay-hobby and started using it for charity. They dress up in a popular character, or a group of popular characters and go visit children's hospitals or co-operate with organisations such as Make-A-Wish. Also, many distribution companies for movies, tv-series or games call for cosplayers (sometimes professionals) to help promote their new releases. Competitions are being held on all kinds of levels: small local ones, massive ones spread over several convention days, even European and global ones. Some events are specifically cosplay-related and Tokyo has the Harajuku bridge, which is a known hangout for cosplayers during weekends.